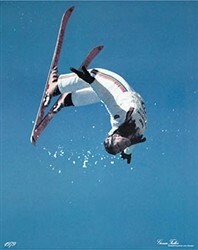 Poster – size 20 x 30 inches. 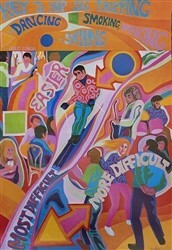 This 1960’s Ski Poster advertises Aspen Ski area. The town of Aspen got its name in the late 1800’s, replacing its original name of Ute City, due to the gorgeous Aspen trees that cover the lower regions of the Elk Mountains. 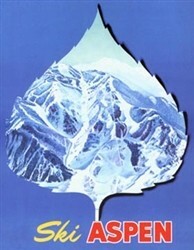 Aspen went from being a mining town, to a ghost town, to a ski town that has always attracted the wealthiest and most famous people in the world, including the Hollywood elite. 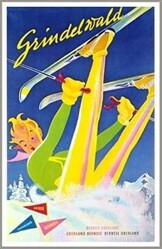 This vintage poster shows Aspen in its pre-quad lift and gondola. The joke in town is, “What do you call a millionaire in Aspen?” Answer: “Homeless!” Aspen is still one of the most unique ski towns in the world, with its 100 year old buildings, its Victorian architecture and its rich history.